A blog all about Buster Keaton - career, films, personal life, image. I've been thinking a lot about The Cameraman. Yes, well, why would I not? The first time I saw it, several months ago, I was not sure I loved it. The second time I saw it, I began to believe it was his very best work ever. And, now, after watching a third time, I realize exactly what makes it such a hard movie to assess. The Cameraman combines Keaton at the height of his physical and creative skill, with the polish of MGM studios, into a film that feels almost perfect. MGM reputedly used this film as required training in how to make a comedy and I can see why that would be. It really does seem to have everything. But what it also has are problems. Just underneath the polish you can detect some strain in the process. The feel of too many hands trying to introduce too many types of funny into this fairly short picture. For instance, there are the the title cards. The attempt at verbal laughs is strained and unnecessary and at times pulls away from the basic simplicity of a wonderful visual story that is definitely strong enough to carry its own weight. Some of the "dialog" simply feels wrong for Buster. Unworthy of him. I didn't notice this the first couple of times, but I see now (after having watched all the rest of his MGM work) that Buster's screen image is already beginning to erode and to take on the form of what will soon be "Elmer." In The Cameraman, Buster is ever so slightly, just beginning to play the fool, with a touch of the hang-dog stance and pleading demeanor that will soon become the hallmark of his MGM persona, instead of the simple guy with the zen-like control that characterized his independent films. And The Cameraman may be just a bit heavy on plot, detracting from the natural simplicity that Buster so excelled at. It's a bit too polished, produced, over the top in some small ways and worst of all, sentimentality is beginning to creep in. The film seems to invite us to feel sorry for Buster. It succeeds at that with a heartbreaking scene at the beach when Buster believes he's lost all chance at winning the heart of his beloved. The scene showcases Buster's incredible emotive skill, but denies his minimalist unaffected direction. Still, the film has aspects that are almost too incredible to put into words - such as Buster at Yankee Stadium doing a profoundly watchable couple of minutes solo-pantomime of a baseball game. And, the scene when Buster and another man are crammed into a tiny changing room getting their swim clothes on must be one of the funniest things he ever did in any movie; or maybe one of the funniest things filmed. Period. 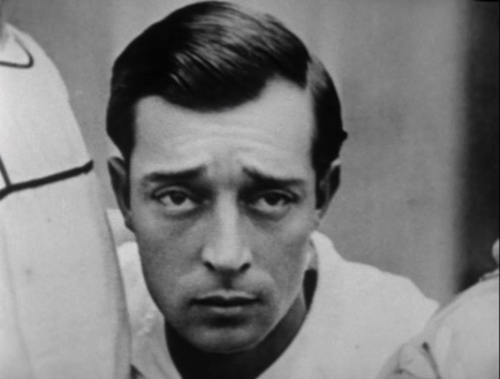 Also Buster's incredible athleticism as he runs up and down flights of steps every time the apartment's phone rings while waiting for a phone call -- followed by scenes of the man simply running through the streets of New York -- raising the thought that no one else has ever made the simple act of running so mesmerizing as Buster Keaton. 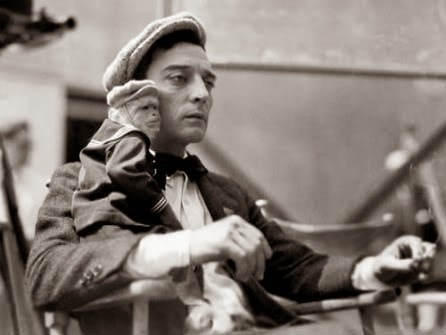 And finally, one of my most treasured elements of this film: the relationship between Buster and the amazing little simian actor who sits on his shoulder, hugs his face, clings to his back and shadows his every move. There are other highlights, but these few alone must surely place it among the very best films of the silent era, flaws and all. This is a really great assessment of The Cameraman. My family and I love that movie and just watched it again last night, and I think you're absolutely right about the movie's strengths and weaknesses. The parts where he's waiting around for Sally to get off work and peeking at her from behind his camera are so much more pathetic than anything in his previous work, it's jarring. On the other hand, some of the scenes, like the whole Tong war sequence, have just as much sweep and grandeur as parts of The General. So, I, too, have a love-hate thing going with the Cameraman. I actually like some of the more emotional stuff in the movie, though I do concede to your point that it is jarring for those used to Keaton's previous work. I feel a lot of it edges on sentiment without going over the deep end. However, the verbal yuks are awful. June 16th Buster Keaton Day in LA! So... WWBKD? Would he be on Social Media?